Over the years we have encountered many Great Bowerbird bowers. 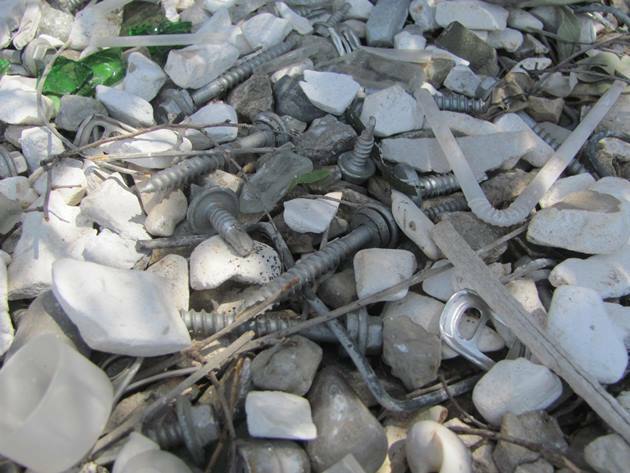 They vary in construction and there is also a wide variation in the items that they collect. 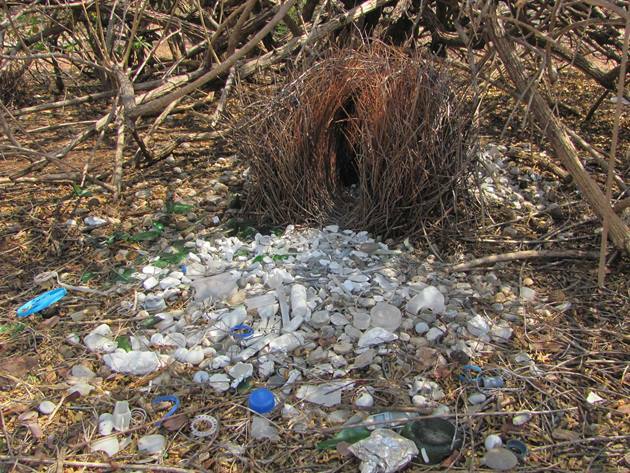 Traditionally the Great Bowerbirds collect mostly white and green items, but this varies by location. 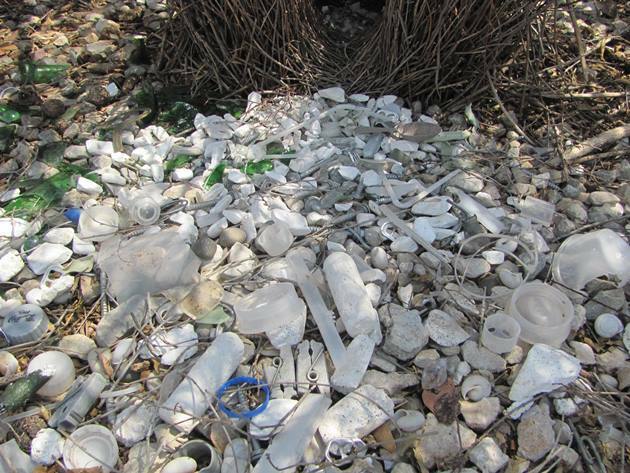 At Keep River National Park the Great Bowerbird bower was almost entirely white bones and it was nowhere near human habitation. At the Katherine Gorge National Park we discovered the Great Bowerbird bower was mostly white items, but there were some additional green items. These green items were for the laying of concrete and despite the size of them had been carried to the bower. At Big Horse Creek the items in the Great Bowerbird bower were also mostly white, but there were a few green items among the pile of “treasures”. These items are to lure a female into the area and we have encountered Great Bowerbird courtship display in that area. Around the township of Broome the Great Bowerbirds collect both white and green items, which are both natural and man-made. 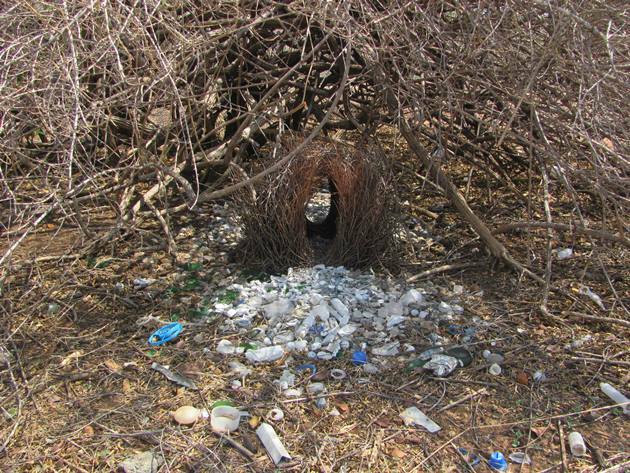 A Great Bowerbird will sometimes move a bower after severe weather events or just reconstruct a bower. The items from the original bower will mostly be moved to the new bower. 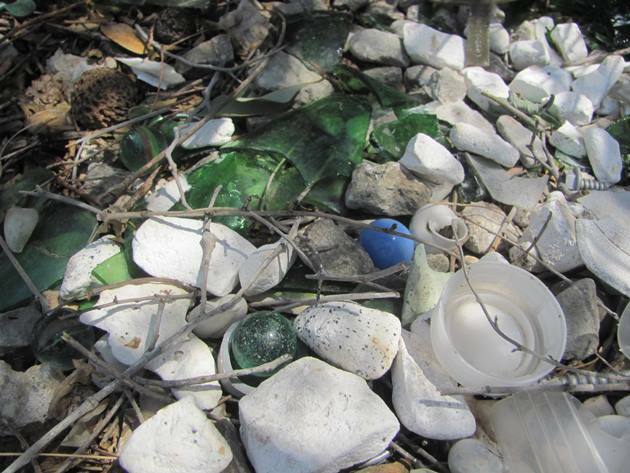 The first time we encountered a Great Bowerbird that had collected blue items was at Timber Creek. It is well documented that Satin Bowerbirds collect blue items. 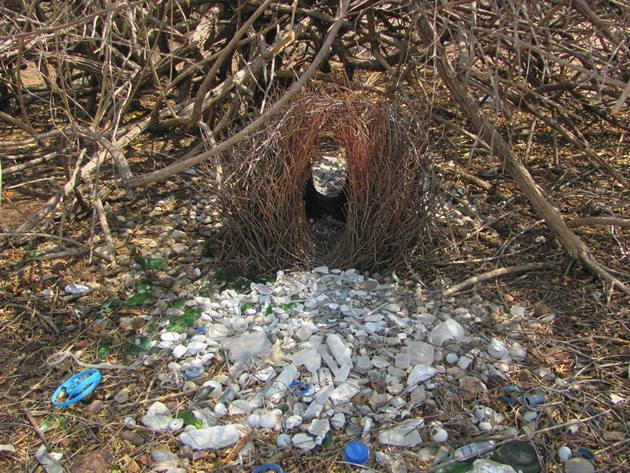 Sometimes we see a Great Bowerbird bower in an obvious position with blue items strewn close by. We have seen tourists throw blue items in the area wrongly presuming that all bowerbirds like blue. We have observed the Great Bowerbird move the blue items away and it is not their preferred colour. 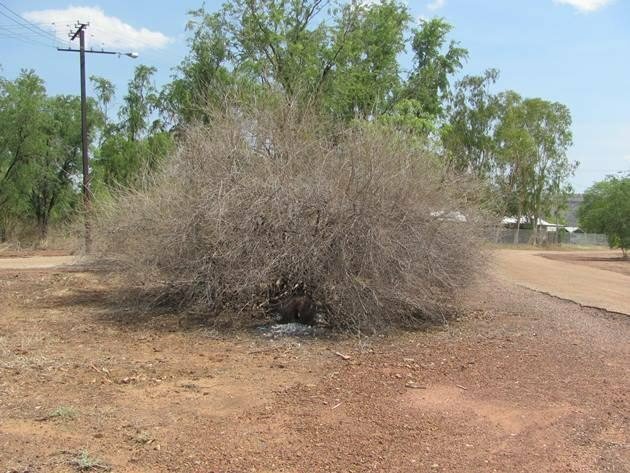 We actually did an experiment at another location in the Kimberley over a few days to see if a Great Bowerbird would take blue items if we left some close by, but no items were moved. At Timber Creek there are plenty of items to add to the Great Bowerbird bower, but for seem reason it has collected quite a lot of blue. It is unclear if it is more about the shape than the colour or could a Great Bowerbird actually be colour-blind? 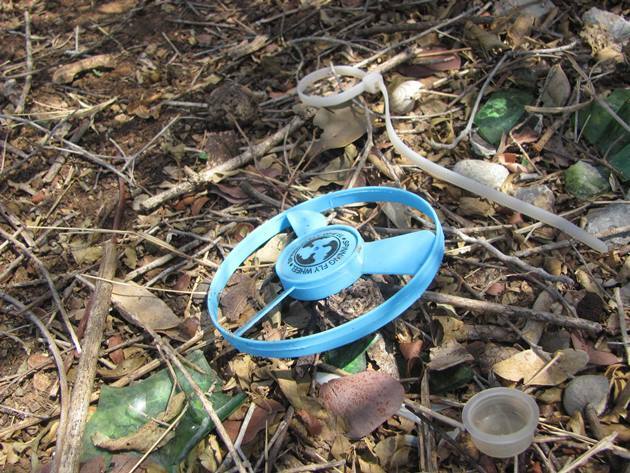 Great Bowerbirds do collect glass marbles, but the presence of a blue marble is unusual and the presence of the blue Spinning Fly Wheel is interesting too. Could this item have been mistaken as being green by a Great Bowerbird? Birds can see more colours than humans, so it is intriguing that this Great Bowerbird appears to like collecting blue! If you do know of Great Bowerbirds, not Satin Bowerbirds, collecting blue then please document it in the comments below. I don’t have any examples for you, Clare, I’ve never seen a Bowerbird bower, but I love this post. I didn’t know color was a factor in what Bowerbirds collected. Yes, each species has preferences! The birds can collect everything like plastic bags, papers, and more, but for the color blue, this is the first time I hear that from your post. Yes, Franck-it is very odd! I’ve only seen them in Broome, it was amazing! I cannot remember and I am wondering if they have different colour preference in the same species? The Great Bowerbird has only ever been documented as collecting white and green, so this is very unusual.